The NHS is in real trouble now, due to a toxic mix of cuts and privatisation. The cuts are serious. Locally, we already face the huge threat to one of the A&Es, and the likely loss of one of the District General Hospitals. It’s probable that the Royal Shrewsbury Hospital is in the firing line, rather than the Princess Royal at Telford – but whichever way round, it’s a disaster for local people if this happens. Tragically, Shropshire GPs have decided to make a bad situation worse. They’re moving now to privatise NHS services – and to award the contracts to a new private company that they’ve set up themselves! GPs in Shropshire, Telford and Wrekin have set up a new private company called ‘STW Provider Services’. It’s a private limited company. GPs are describing it as a ‘GP Federation’ that will cut costs in backroom services like admin and reception – but there’s something more sinister going on. 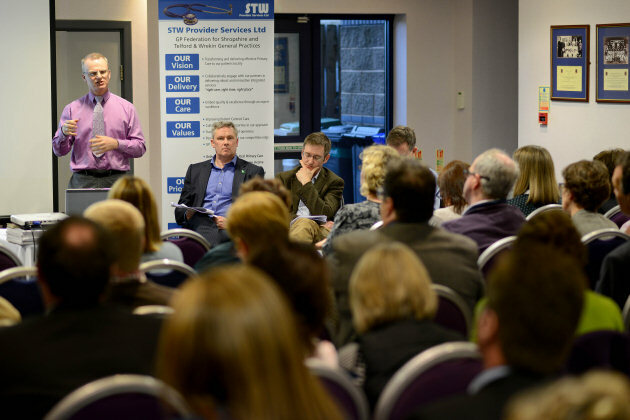 The name of the company, STW Provider Services Ltd., wasn’t highlighted in the GP’s launch. The new private company will bid for NHS work. That means that NHS services currently provided by NHS organisations and NHS workers are likely to be transferred out of the NHS and provided by the private sector instead. It could be that this new business will offer the services itself, or – something that’s happened recently in Bedfordshire – that it will join up with bigger private healthcare providers instead. Either way, the NHS gets privatised – and existing NHS organisations like the Community NHS Trust and the Hospitals NHS Trust risk going bust as they have services taken away from them. While the initial press reporting seemed to imply the STW Provider Services Ltd. was a not-for-profit organisation, that appears not to be true. The company’s Articles of Association, filed with the Registrar of Companies for England and Wales, makes detailed provisions for dividend payments to the shareholders – the GPs (Articles 147-167). “GPs should be defending the NHS, not helping to privatise and dismantle it. There’s nothing wrong with GPs clubbing together to save money on stationery and support services, but to set up their own company to bid for NHS work is just wrong. This transfers work out of the NHS and into the private sector. Is this what patients want? It’s also incredibly destabilising for existing NHS organisations, which will have to make cuts to other NHS services as they lose money to the new private company. This is really bad news for patients who need services like district nursing or physiotherapy”. “The conflict of interests is huge. GPs belong to the Clinical Commissioning Groups that put NHS services out to tender. The same GPs will bid for the work to go to their new company. The same GPs will then award the contracts. I wonder who to! This is just unacceptable. This is our NHS. It belongs to all of us. We don’t want it carved up and cherry picked. GPs should know better than this”. This entry was posted in Uncategorized and tagged GPs, STW Provider Services Ltd.. Bookmark the permalink. Some of us don’t “do” social networking but might like to forward this info to like-minded others. Under “Share this” could we also have an email option. Just been to a Healthwatch consultation meeting in Shrewbury. Discovered that the Acute Care Strategy group plan to reconfigure acute care in Shropshire before the next general election. Sounds to me like the decision about our A&E has already been taken. The representative from Future Fit knew nothing about it.Her role is communications so why has she not been informed? STW Service Providers Ltd has the same registered address as the Shropshire Doctor’s Co-operative Ltd (SHROPDOC). Is SHROPDOC, the out of hours service, also operating for PROFIT? In 2012, Shropdoc reported a turnover of £10m and gross profit of £1.7m. GP’s have bled the NHS dry for years, it is time Nurse Practioners took more of the roles and we reduced the number of Doctors then perhaps the power they feel they currently have would be diminished. Doctors should be in the hospitals nurses refer the patients to them and then you know that you are going to get specialised treatment by a doctor who knows what they are doing.